To normalize the position coordinates of particles for an Image Texture node, I have to divide 1 by a very large number (119,617). After running some tests, I see that the colors of my image texture are off by a factor of about 1e-4 (0.0001). This has me wondering: how many decimal places does the Math node retain in its output? I've noticed that some fields (e.g., the values for a Divide operation) accept up to three decimal places (and that everything beyond that third decimal place is simply rounded up or down). Is the same true for the output of the Math node? If so, is there anyway to change the output precision so that I get at least 6 decimal places in my output? Many thanks if you know the answer and care to share it! EDIT: Jaroslav pointed out that color is shown in the Data-Blocks view of the Outliner panel with six decimal places. However, when I look at the same view of my outliner, I see only three decimal places. Compare my screenshot (below) to that posted by Jaroslav. This is under Blendfile Data > Images > StarCol > Pixels. Is there a reason for this difference? Am I looking in the wrong place in the Data-Blocks view? Can I trust that under the hood the full RGBA color values are being used (at least to six decimal places)? I would post this in a separate question, but as I'm only asking for clarification, it seemed best to do it here. Thanks again! EDIT 2: The Python output for the pixel color values, on the other hand, has far more decimal places than just six! I assume that the values shown in the Outliner panel and in the fields of the Math node are shown with three decimal places for conciseness only? 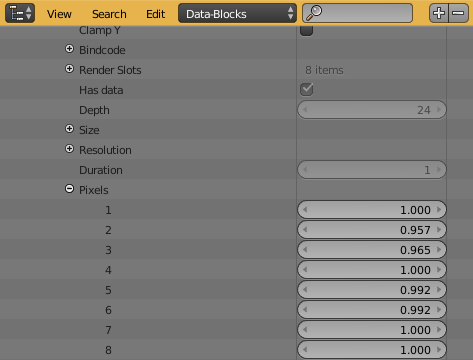 It would be disappointing to have the full precision stored in the Blender file and not using it! For values Blender uses IEEE single precision floats. This gives a precision of about 7 decimal digits. The displayed value is rounded to 3 decimal places and the displayed value when editing the field to 6 decimal places (probably because the precision limitations). The RMB value viewer in image editor of render output is rounded to 5 decimal places, but render values will render in full 32bit. Stored and rounded in format you choose. All of these cannot explain the 0.0001 error you are seeing. The problem is somewhere else than in precision of Blender math or your math is more complicated than what it seems and your floating point limitations snow-balled into the 0.0001 error. There is no way to change the precision of the values. They should be 32bit floats. I think the problem you are experiencing is not precisely about decimal places. The way I understand it, it is about binary precision. Numbers are stored in binary and a lot of finite fractions in decimal format can only be expressed as infinite fractions in binary for example decimal 0.1 will be repeating infinite fracture in binary: 0.00011001100110011... so it will actually be stored as an approximate value. The actual way numbers are stored is more complex than it seems. You can search for something like '32bit float' to find out more about it. However the problems with precision remain. You will have to come up with another way to do what you are doing if more precision is needed. It might be useful to post another question describing what exactly you are trying to do when you face this issue. The solution might be possible at another point in your workflow. Thank you all for the very thoughtful replies. I have a better sense of what's causing the error and I figured I'd share for those in the future who experience this. The problem has nothing to do with numerical errors. I learned a lot about numerical precision and some best practices to keep in mind, like using 32-bit EXR image textures for very large particle systems to avoid rounding-off errors, but I'm happy to say that my issue has to do with the particle index itself. The real problem is probably that I went on the assumption that the index of a particle would match that of the underlying vertex (from which it is generated). But, it seems, at least for some particles, that is not the case. I checked the actual location of a specific particle (#32263, the Hipparcos catalog number for Sirius A), and compared it to that of vertex 32263. Turns out the two are in different places on my screen. I also checked which vertex the particle coordinates correspond to. It's vertex 32250, or minus 13 positions left of 32263—precisely the error I had observed for this star (which, mysteriously to me until now, had been getting its color from a pixel 13 positions left of where I expected it to be). I haven't corrected the issue yet—now I have to figure out why the particle and vertex indices don't match (I guess they generally don't?) and see if I can constrain them to be the same—or, if I can't, at least figure out how to map the particle indices to the vertex indices (a must, since the vertex indices match the Hipparcos catalog indices, which I need to retrieve the star properties in my Python script). Hope this helps someone in the future and thanks everyone again for patiently writing your responses. I learned things. Not the answer you're looking for? Browse other questions tagged cycles nodes mathematics or ask your own question. how are the math node operations in cycles calculated? Decimal places in RGBA values of Python-generated image? View input vector values of Image Texture node? How to view value of node output? Color ramp isn't working correctly with particle info node? Is there a way to utilize simple math operations for color correction?